Homes for Sale Abacoa - Search homes for sale in Abacoa. See all MLS Real Estate and homes for sale in Abacoa, Jupiter FL. Community info, photos, and listings. Homes for Sale in Abacoa are part of a master-planned community boasting a great combination of fun family life, businesses, and academics. 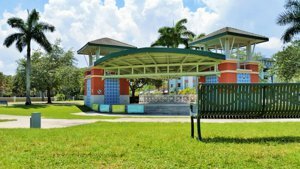 In addition to the proximity of stellar education, the Abacoa community encourages neighbors to connect and stay active with many Abacoa recreational amenities. Real estate and homes for sale in Abacoa features a collection of 20 neighborhoods, each featuring its own amenities. There is a mix of single-family homes, townhomes, and condos with a range of prices to meet all budgets. A special feature is spectacular views of the Greenways, preserved Florida ecosystems spread throughout the community. When considering homes for sale Abacoa you'll find numerous trails, natural Greenways, and parks provide opportunities to take in the natural scenery while jogging or spending time with friends. To cool off, residents can take a dip in the pools. All of the activities promote a sense of community between neighbors. 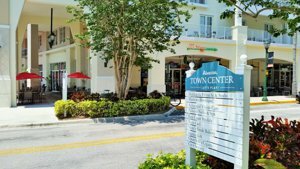 Abacoa has its own Town Center that blends restaurants, stores, and offices with a nearby golf course, a quirky Main Street, and local university campuses. Every year, the Town Center hosts many festivals, outdoor concerts, and car shows, so there is something for everyone’s interests. Downtown has plenty of boutiques to find the latest fashions. Plenty of stores offer services like photography, spa treatments, and tanning. For tasting new cuisines, the restaurants will not disappoint: options include seafood, Italian, French fare, and German dishes. Sports fanatics will enjoy Abacoa’s proximity to a popular baseball venue and golf course. 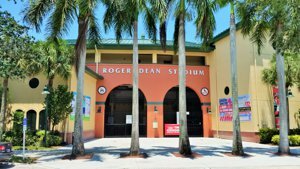 Roger Dean Stadium, in the middle of town, hosts spring training for the Florida Marlins and St. Louis Cardinals MLB teams. Minor-league teams, the Palm Beach Cardinals and the Jupiter Hammerheads, also play here, and post-game fireworks turn a visit into a party. The Abacoa Golf Club features public championship courses for everyone to share—no membership required. call or text the Abacoa Experts, Thom and Rory. Residents of Abacoa are served by the School District of Palm Beach County. These schools always receive high rankings, making Abacoa’s neighborhoods well-suited for families. The area is near several private schools as well. 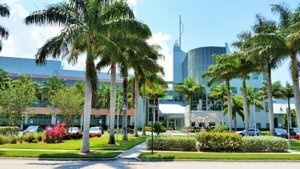 For higher education, Abacoa is close to the Jupiter campus of Florida Atlantic University and the Harriet L. Wilkes Honors College. Allegro caters to Jupiter’s retirement community, offering 24-hour services to meet everyone’s needs. There are options for independent living, assisted living, and memory care. Antigua has a unique feature: its townhomes have first-floor space for businesses, allowing residents to work out of their own home. Upper floors have living space, but there are also strictly residential townhomes. SEE ALL ANTIGUA HOMES HERE. Cambridge has single-family homes with 2 bedrooms and various-sized townhomes. Preserved natural areas within the neighborhood offer stunning views of Florida’s landscape and wildlife. SEE ALL AVAILABLE CAMBRIDGE HOMES HERE. Canterbury Place has beautiful French Country or Tuscan designs for its single-family homes and townhomes with a variety of floor plans. Townhomes have private courtyards with 2 car garages and some have garage apartments, and single-family homes have 2-car garages. SEE ALL CANTERBURY HOMES HERE. Charleston Court’s charming Victorian-style townhomes have 3 bedrooms in 2-story floor plans. The homes overlook the stunning Abacoa Golf Course, and oak trees lining the street provide shade. SEE CHARLESTON COURT HOMES HERE. Dakota’s luxury condos and townhomes feature Bermuda-style designs and modern interior spaces with upscale amenities like Island kitchens and granite countertops. Residents have a community spa, pool, fitness center, and conference room. Greenwich residents live in townhomes with 3 stories, and many have attractive views of the lakes and nature preserves. Like Antigua, some townhomes have lower floors for business space and upper floors for living space, making it easy for those who work from home. There are also residential townhomes with gorgeous lofts. ALL CURRENT GREENWICH HOMES NOW AVAILABLE HERE. Mallory Creek’s newer single-family homes, townhomes, and condos have a Key West theme featuring luxury amenities like granite countertops and metal roofs. All are offered in a number of sizes, giving choices for everyone’s lifestyle needs. SEE ALL MALLORY CREEK HOMES NOW AVAILABLE HERE. Martinique mixes single-family homes and townhomes with spectacular Caribbean-inspired designs. Single-family homes range from 2-5 bedrooms, making them some of the biggest residences in Abacoa. Custom-designed single-family homes are also available. SEE ALL MARTINIQUE HOMES NOW ON THE MARKET HERE. New Haven has various sizes of single-family homes and 2-story townhomes built with stunning Victorian designs. Beautifully colored trees line the streets, and residents plan fun holiday events. SEE ALL NEW HAVEN HOMES NOW ON THE MARKET HERE. Osceola Woods real estate has condos with up to 3 bedrooms, and like Antigua and Greenwich, have office spaces on the first floor. Many of these business rooms have been transformed into media rooms, allowing space for residents to relax amid luxury amenities like hardwood floors and granite countertops. SEE ALL OSCEOLA WOODS HOMES NOW ON THE MARKET HERE. Somerset has townhomes with 2 or 3 bedrooms and condos with 1-3 bedrooms. Both feature balconies to enjoy the Florida weather and indoor upscale amenities like granite countertops and wood floors. SEE ALL SOMERSET HOMES NOW ON THE MARKET HERE. 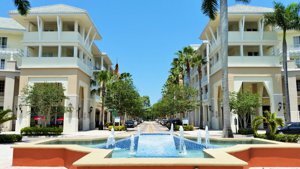 Allure at Abacoa has new upscale townhomes, lofts, and flat apartments. Bedrooms have carpets and bathrooms have stylish ceramic tile floors. Residences are pet-friendly (under 60 lbs.) and have access to a private dog park. Island at Abacoa has single-family homes and townhomes in Victorian fashion designs with deep porches. 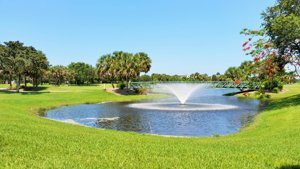 Residents in single-family homes have gorgeous views of the surrounding Abacoa Golf Course. SEE ALL CURRENT ISLAND AT ABACOA HOMES AVAILABLE HERE. Sophia at Abacoa is the only rental neighborhood in the community. The pet-friendly apartments have 1, 2, and 3 bedrooms. Upscale features include walk-in closets, ceiling fans, balconies, and patios. Tuscany has townhomes and single-family homes with stunning Mediterranean colors and architecture. Single-family homes range from 3-5 bedrooms and townhomes have either 3 or 4 bedrooms. SEE ALL TUSCANY HOMES NOW AVAILABLE HERE. Valencia’s single-family homes are sophisticated with arched doorways or charming iron gates. Terracotta roofs lend beautiful color and indoor luxury amenities include marble floors and spacious master suites. SEE ALL THE VALENCIA HOMES NOW AVAILABLE HERE. Village at Abacoa Town Center are condos that overlook a beautiful green area. Some residences are above the shops and restaurants on Main Street while others are in free-standing buildings. SEE ALL VILLAGE AT ABACOA HOMES NOW AVAILABLE HERE. Windsor Park’s new real estate consists of single-family homes and townhomes, offering the ability to buy a recently built property in a gorgeous location. Many homes have spectacular views of the nature preserves. SEE ALL WINDSOR PARK LISTINGS NOW AVAILABLE HERE. See all currently listed Abacoa homes now available below. BE SURE TO CONTACT US TO GET ON THE LIST OF NEWEST HOMES IN ABACOA AS THEY BECOME AVAILABLE. WELL PRICED HOMES IN THE COMMUNITY WILL GO QUICKLY. BE SURE TO GET ON OUR ADVANCED NOTICE LIST TO RECEIVE IMMEDIATE NOTICE OF THE LATEST LISTINGS PRIOR TO OR WHEN FIRST PRESENTED ON THE MARKET IN THE MLS. To get on the Abacoa waiting list Call: 561-741-9666 or Text: 772-349-8466.